If you are aware of the MoU between NE, NRW, the CPS and the National Police Chiefs’ Council then I doff my cap to you. I’ve only recently been pointed in its direction. So, a valuable if not completely rivetting document. I tended to avoid MoUs when they came my way as anything that needed the level of U to be written down usually meant that there wasn’t that much U around. But they have their place in life. This document, signed by all parties in September or October 2015 ran for two years and should have been reviewed and renewed in autumn 2017. As of July 2018, almost a year into its next term, it had not been agreed. Perhaps this makes no difference to work on the ground (but if not then why have an MoU in the first place, and why stipulate that it needs renewing every two years?) but maybe it does. The main reason for the delay is that NE requested a delay as this email from the NE Species Enforcement team to the Police Chiefs’ lead on this matter, Inspector Alex Butterfield, dated 18 July this year, makes clear. Is this Defra, perhaps Therese Coffey, dragging their heels? Out of interest I looked up the MoU, as it may have some bearing on my poorly performing but still open petition. The MOU says: "all cases within the National Wildlife Crime Priorities .... should be referred to the CPS for a charging decision." My interest was piqued further by this as I've always wondered if the "Tillypronie case" involving an illegal trap ever reached court. The guardian article does not say whether the gamekeeper was charged. If the police can only charge an alleged offender in Scotland after a decision by the Procurator Fiscal Service it may be that the decision not to proceed in other cases including one involving an illegal trap revealed in 2017 came was only after a decision was made in this case up to 3 years earlier. Of course we can never be certain and I've been unable to determine whether this case ever reached court. It may help explain some matters but not all. I wonder if we will ever find out more. Clearly I should not have tried to insert an HTML tag. Three words still hang over Defra and Natural England*, that is to ask again if they are "Fit for purpose"? Perhaps they should update the title if it is renegotiated - 'In memoriam of understanding' perhaps. You may consider the following to be mere speculation, and a conspiracy theory. I would not blame any reader for assuming this. I have now considered this further and reviewed two of my my website entries. This gives CPS an opportunity to prevent charges being brought even where the police may believe they have sufficient evidence available to them, and may not be entirely innocent. 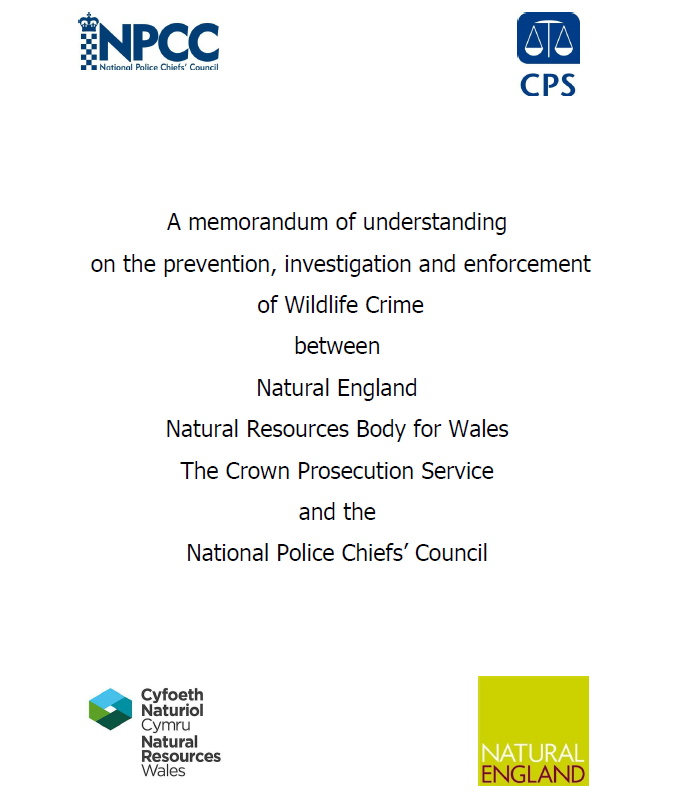 I cannot find a similar document for Partnership Against Wildlife Crime Scotland. I have now added another item in Timeline in my blog, which explains for me, anyway why this was inserted in the MoU. Taken from a freedom of information request on the excellent RPUK website, asked for by "You forgot the birds" unbelievably. I don't have the skills to add the website address. "The concerns I have about several recent and ongoing cases of raptor persecution go beyond issues of deliberate poisoning/pesticide abuse and into such areas as illegal shooting and trapping. My concerns and those of my team centre on the role that the RSPB Investigations Team has/is playing in all of these cases. I will not go into the specific issues of each case, but there is a pattern whereby neither the NWCU nor Natural England are being made aware by PWCO’s and other Police officers of developing cases until enforcement actions such as warrants have already been taken or are imminent." "Over the next few months I will be working on developing the SOP for the Police. I will involve you all directly in this to ensure the document reflects the need for a close working relationship between us." Is it clear to anyone else? He wanted control away from the police, and wanted RSPB well away from Wildlife crime investigations. He certainly managed to influence the MoU, and possibly allowed COPFS to prevent some charges being brought. Mark, if this is too strong for your blog, please let me know. For interest, my blog, due to this post, now has it's own post. It covers the matters here, relating how it could be that the apparent desire of DI Nevin Hunter to discredit the work of the RSPB may have led via the MoU to the decision of COPFS to prevent the Scottish police force from charging a suspect. Having done so, felt obliged to discontinue 2 cases, one of which bore remarkable similarities to the one where charges may not have been brought. If the 2 case had proceeded to court, it may have called the decision not to charge into question. It's not really much of a stretch, in my opinion. Would have been nice for them to get the names right though - no such thing as the "Natural Resources Body for Wales"... Natural Resources Wales, yes. Equally hideous name though.